Infa Secure's Kompressor 4 Astra with ISOFix is the A4 rearward facing convertible car seat you've been searching for! Offers one of the shortest 0-4 car seat rearward facing lengths making it great where space in your vehicle is limited. The Versatile Folding Booster is a unique booster seat designed for ease of use and portability. The Arlo Stroller is designed for your lifestyle. 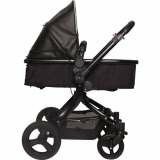 It’s practical, feature packed and extremely good looking.Arlo features three modes of transport, easily converting from a bassinet style pram, to rearward facing stroller, to forward facing stroller. With the most compact rearward facing depth on the Australian market, the Arlo Infant Carrier is the perfect choice for small cars (or long-legged parents!). Interchangeable newborn comfort insert & hood sets are available in 7 vibrant colour options (extra sets can be purchased separately, too! ).